More than 200 people arrived at the Patil Theater this evening to see the Miró Quartet perform at the second event of the 2018-19 Harker Concert Series season. 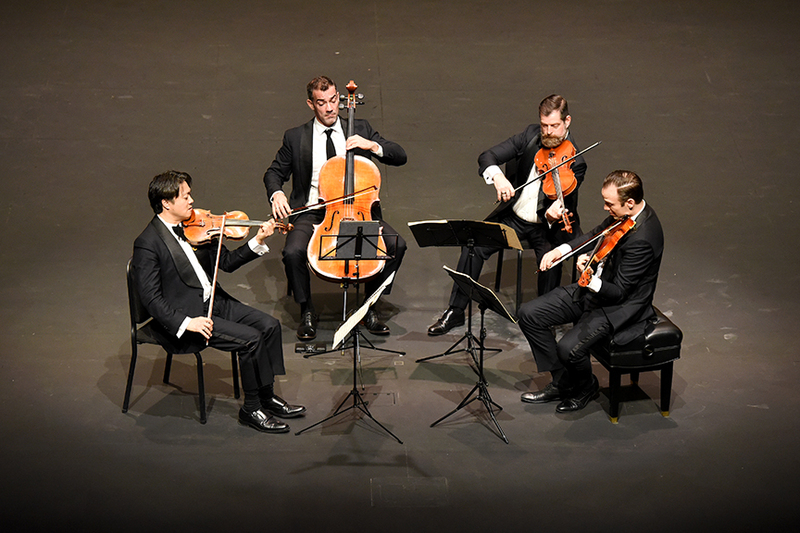 Since its founding in 1995, the Miró Quartet – comprising violinists Daniel Ching and William Fedkenheuer, violist John Largess and cellist Joshua Gindele – has claimed first place at numerous competitions, including the Banff International String Quartet Competition. In 2005, it was the first string ensemble in history to receive the Avery Fisher Career Grant. In its second Harker Concert Series appearance, the quartet’s program consisted of works by Franz Schubert, Leoš Janáček and Felix Mendelssohn, and the Patil Theater proved to be a splendid venue to hear them performed by a group of superb, accomplished musicians. Schubert’s bittersweet melodies and the fiery, tumultuous passion of Janáček’s “Intimate Letters” (believed to be inspired by the affectionate letters he exchanged with a woman many years his junior) rang brilliantly through the theater’s acoustics. During a brief talk between the first two pieces, Largess remarked that those in attendance made up “the youngest audience we’ve played for in a long time,” which was fitting given that Schubert and Mendelssohn were both in their teens when they composed the pieces in this evening’s show. Following intermission, the quartet closed with Mendelssohn’s “Quartet in A minor, Op. 13,” another piece created by someone in love, albeit much earlier in life. Though perhaps less intense than Janacek’s work, it expressed a similar range of emotion, fully realized in the Miró Quartet’s very capable hands.